Through the leadership of the government of Lesotho and the support of USAID and Jhpiego, more than 108,000 men have received medical circumcisions to prevent HIV. Machache, Lesotho—As a teacher, Moeketsi Mokhele knows the value of knowledge. When he learned about the health benefits of voluntary medical male circumcision (VMMC), he wanted to ensure that other men in his community had the same information and could access these free HIV prevention services. His story began when VMMC mobilizers (organizers) coordinated a sports tournament in Machache—a 90-minute drive from Lesotho’s capital of Maseru. The tournament, which included volleyball and soccer, was a way of engaging the village men and teaching them how circumcision helps prevent the spread of HIV. The VMMC mobilizers encouraged the men to take advantage of the free comprehensive package of HIV prevention services at a nearby health clinic. The VMMC program, launched in February 2012, was offered by the Lesotho Ministry of Health with the support of Jhpiego and funding from the United States President’s Emergency Plan for AIDS Relief (PEPFAR) through the United States Agency for International Development (USAID). All the men and their sons were encouraged to participate, and women were also urged to encourage the males in their family to attend. At first, there seemed to be much enthusiasm for the service. Mokhele and his two sons, ages 15 and 19, went to the clinic to receive the services. However, few other men and youth did. Mokhele worried that social norms and cultural restraints could be keeping Basotho youth and men (that is, ones from Lesotho) from accessing the services. Apart from never talking about sexual issues with women or children, most men believe having many sexual partners is a display of their power and manhood, behavior that puts them at greater risk of contracting and transmitting HIV. Men also rarely seek health services at facilities, which they perceive to be places for women. Deciding to take direct action, Mokhele asked his village chief to organize a community meeting to again reach out to the men of Machache with the help of the VMMC mobilizers. The village women were again invited to hear the benefits of circumcision, but Mokhele made it clear that the village men, as the heads of household, should lead the way. He also telephoned a local radio station to air his concerns, and to explain why circumcision is beneficial to women as well as men. Because of his actions, 50 clients were circumcised the weekend after the community meeting, and others signed up for a later date. Nearby villages also demanded that the circumcision team bring the service to a health center close to them. 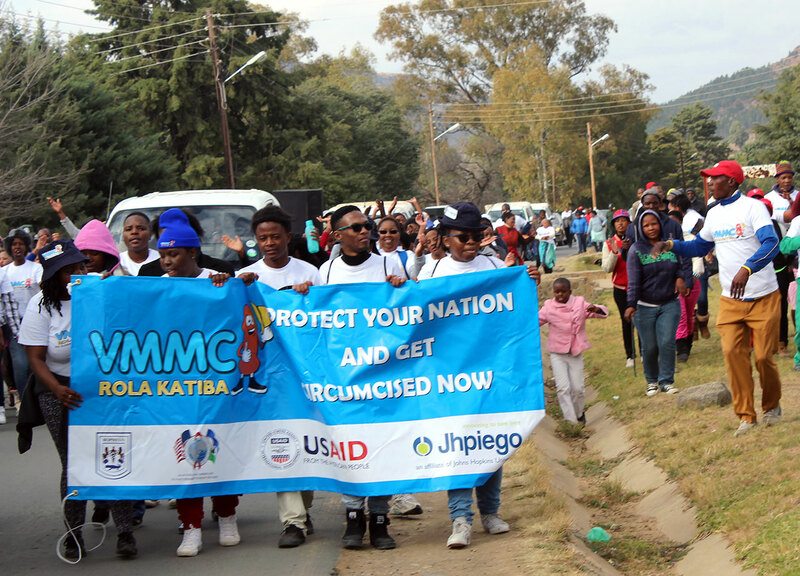 Prior to 2012, when the Lesotho Ministry of Health stepped up its VMMC programming with Jhpiego’s assistance, about 4,000 male circumcisions were performed annually in the southern African nation. Statistics show that resulted in nearly 18 percent of Lesotho males getting circumcised. With the support of PEPFAR, USAID and Jhpiego, more than 108,000 medical circumcisions have been performed in Lesotho to date. Thanks to the local leadership of men such as Mokhele, that number will certainly keep rising.